Get with the Industry-Leader in Bed Bug Control! Eco Systems Pest Management has been in the forefront of bed bug prevention and control. We were one of the first companies in the US to introduce thermal remediation (heat) treatment to the war on bed bugs. We believe in total eradication of a bed bug problem through treatment, education, and prevention. A conventional treatment consists of a three treatment process that typically includes the use of a combination of liquids, dusts and/or aerosols. This safe, effective, and environmentally friendly process uses dry heat to kill the entire life cycle of bed bugs, while reducing the application of insecticides. What is a Chemical Treatment? A conventional chemical treatment starts with properly preparing the property to be treated. This is done so that when the technician arrives they can perform a thorough inspection to locate the source of the infestation. It also allows the technician the ability to strategically place materials to eliminate that activity. A conventional treatment consists of a three-treatment process with which typically include the use of a combination of liquids, dusts and/or aerosols. This program, though labor-intensive, has an astounding rate of complete bed bug elimination. Most bed bug treatments are extremely tedious, require multiple visits, a significant amount of preparation, and use of insecticides to control the situation. As time goes on, bed bugs are growing increasingly resistant to known methods of extermination. There are also a dwindling amount of treatment alternatives due to increased regulation on chemical options. However, with the use of heat, a bed bug infestation can be eliminated in a shorter period of time without the use of chemicals. This allows business to resume normal use of the treated space more quickly. Bed bugs are one of the hardest insects to control in the industry today. They are showing resistance (immunity) to almost all of the most common types of insecticides used by the pest control industry. Even with rotation of various types of insecticides, control is extremely hard to achieve. Thermal kills through heat, and therefore does not have to worry about chemical resistance. An informal survey of pest control operators conducted by an entomologist at the University of Massachusetts found that 68% of all bedbug infestations require three or more treatments, 26% require two treatments, and only 6% require just one. With a thermal treatment, bed bugs are eliminated in a single visit. Preparation is also another factor when treating for bed bugs. With standard treatment methods, the service requires extensive home preparation for each visit. In contrast, heat treatment requires less preparation per visit, as well as less visits overall. What is a Thermal Treatment? 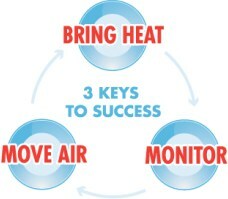 For heat treatments to be effective it is important that all parts of the area being treated reach lethal temperatures. Eco Systems Pest Management will prepare a customized heating plan which will consider the layout of the area and its contents. This allows the heat treatment equipment to be placed optimally to ensure the appropriate temperature is reached. Thorough inspections are a vital step in the bed bug elimination process. These inspections include not only the infested room, but adjoining rooms as well. This system allows Eco Systems Pest Management to pinpoint exactly where there is any insect activity and to target heat directly to the infested areas. Prior to heat treatments, customers receive Bed Bug Heat Treatment Instructions Which will Provide all necessary pre-treatment and post treatment information that will be needed to make the heat treatment a success. Typically, Customers may return to the treatment area the same day. Temperatures will likely still be slightly elevated when you return and items may have been shifted to aid in the even distribution of the heat. Customers will receive complete post-treatment instructions prior to the start of the service. How does a thermal treatment work? Thermal remediation uses heat to kill bed bugs at any stage of their life cycle. The target temperature during treatment is between 120 and 135°F. This temperature range is critical for heat to penetrate bed bug living areas. This safe, effective, and environmentally friendly process uses dry heat to kill the bed bugs, while reducing the application of insecticides. This non-chemical, non-toxic treatment penetrates wall cavities, closets, furniture, and other hard to reach locations to eradicate bed bugs at every stage in the life cycle. A heat treatment done correctly will eliminate all bed bugs (including the eggs) in one application. Heat is an effective way to control bed bug infestations. Insects naturally inhabit areas where the temperature is optimal for their growth, survival and reproduction. 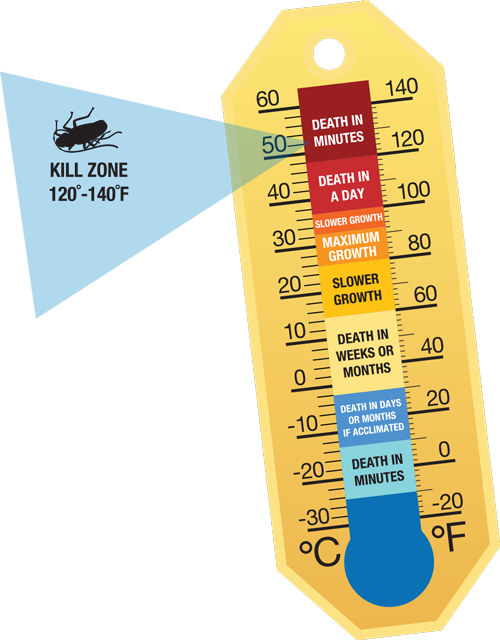 Likewise, all insects have temperature limits that will kill them in all stages of the life cycle. By targeting temperatures in this lethal range, the bed bug population cannot survive, and you will be left with a pest-free area. The heat from the treatment kills bed bugs by dehydrating the insects. The high heat/low humidity atmosphere formed in the space effectively causes the bed bugs to die due to lack of moisture. Therefore, the lower the humidity of the heated space, the quicker the quicker the insect die. Twenty-four individual sensors monitor the temperature in their specific area and relay the information to the computer of the heat monitoring system. The data display shows temperatures recorded in real-time from each sensor. If the temperature in a certain spot is too hot or too cold the equipment can be adjusted so there is an even temperature throughout the area.